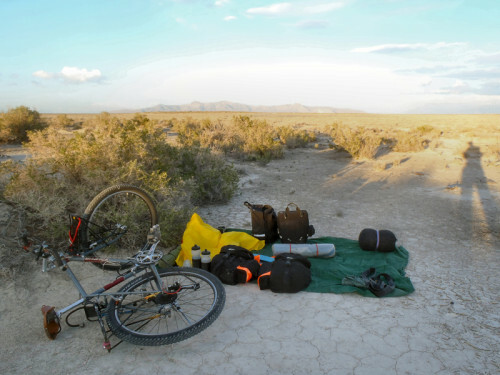 The following is a brief description of a trip taken by bicycle into the deserts of Utah and Nevada during the month of April, 2014. It was a beautiful morning in mid-April. The sun was working its way up from the mountains to the east as the remnants of the previous night's storm moved through the valley. The air was fresh and clean, the commuter traffic was light, and I was eager to get away from the hubbub of the city. But for the moment my bicycle and I were holed up under a freeway overpass out past the Salt Lake City Airport waiting for a minor rain squall to pass. I was only an hour from home, and I was prepared for just about anything Mother Nature might throw my way, but I wasn't especially interested in getting wet so early in my journey. So I watched the rain fall, listened to the hiss of traffic passing above, and considered the tasks ahead. It was spring break time again for the school district I work for, and I was looking for a chance to relax. I was determined to temporarily move all thoughts of the 26 little darlings with which I spend my days to some less intrusive region of my consciousness. I had six days ahead of me, and I knew that nothing clears the brain and strengthens the body quite so well as a few days traveling on a bicycle. 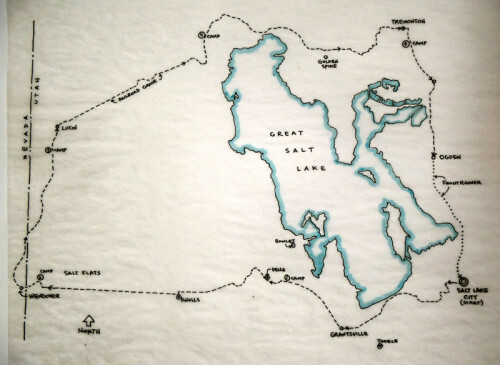 I was heading west out of Salt Lake City with a general plan to ride clockwise around the Great Salt Lake. 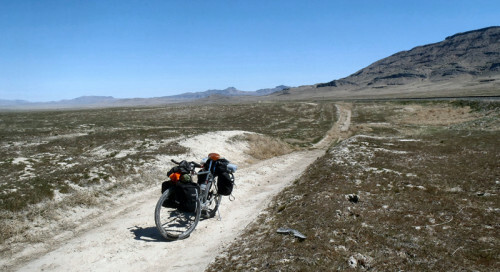 I would ride out to Wendover, Nevada first, then continue north, skirting the shores and flats of the lake. I would work my way east through the northern regions of the state, then back south again along the Wasatch Front and home. I would be traveling alone, and I would be self-supported. And like many of my past trips, I would be riding some routes that were familiar to me and others that would be entirely new. I was anxious to get moving! Once the rain had stopped I carried on out across the valley to the west, using the back roads to avoid the high-traffic routes whenever possible. I took a break in Magna, then picked up the main road that takes traffic west around the north end of the Oquirrhs, past the Kennecott smokestack, and then onto Interstate 80. Quiet roads, south of Lucin, looking north. I always feel a bit nervous on those rare occasions when I'm forced, as I was on this first morning, to interact with the traffic on our interstate highway system. There are usually frontage roads or bypass routes for slow traffic to use, but the stretch of I-80 that carries traffic around the north end of the Oquirrhs offers no good options for cyclists, so I was a bit stuck. Admittedly, the piece of freeway in question was a fairly short run of only a couple of miles, and the shoulders are nice and wide, if a bit trashy. And the views of the Great Salt Lake and the Oquirrhs can be marvelous, too. So I probably shouldn't complain. But because everyone's traveling so fast I tend to put my head down and push myself to get through as quickly as possible. Unfortunately, as I merged with the interstate traffic on this particular April day I encountered stiff winds and a final pulse of wet weather as the last of the storm moved off the lake. Those conditions added extra layers of stress to the the experience, but within 20 minutes I had exited the freeway and was sipping a hot drink at a fast-food joint on the road to Tooele. First campsite, north end of Skull Valley. A few miles south of the freeway I left the main road to Tooele and turned west onto the road to Grantsville. The maps describe this road as a piece of the old Lincoln Highway, the first “improved” transcontinental highway in America. In this part of the country, much of the old route has been covered over by I-80, but pieces of the old roadway can still be found. In the days ahead I would find myself riding on sections of the old road as I worked my way west. By early afternoon the clouds had moved on to reveal a dusting of new snow on the Oquirrhs and on the Stansbury Mountains to the west. The scattered winds of the morning had become a steady flow from the northwest that cut into the progress I had hoped to make that first afternoon. Though the sun had come out, it was hardly warm, and I was dressed for cool weather riding. 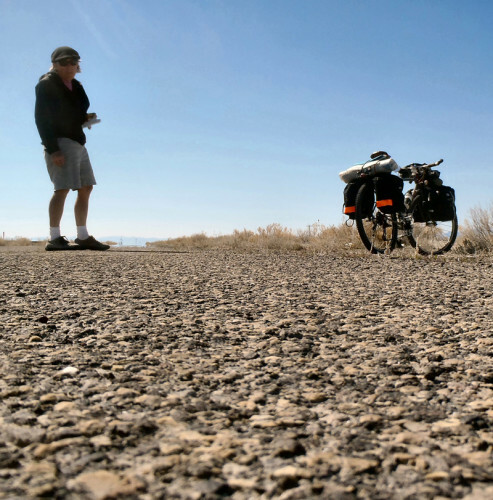 I fixed a flat in Grantsville, then headed out into the wind toward the north end of the Stansbury Mountains where I would meet up with I-80 for the second time that day. Fortunately, at the north end of the Stansburys there are route options for the cyclist. Old paved road surfaces (more remnants of the Lincoln Highway) and dirt roads adjacent to the interstate provided easy passage around the north end of the mountains. As I rounded the mountains and entered the north end of Skull Valley I passed a large pond of water called Big Spring, once a popular watering spot for pioneers and other transcontinental travelers. The sun was pretty low in the western sky by this time, so I began to think about a camping spot for the night. At the Skull Valley exit on I-80 I crossed to the north of the interstate and pedaled west along a paved road that parallels I-80 for a few miles. Traffic on this road was very light, but I left the road just as it turned to the north toward Rowley and the magnesium operations near the lake. I continued west along a very minor dirt track that headed off toward the south end of the Lakeside Mountains. At one point I left the track and pushed my load through the scattered brush at the edge of long-dried mud flat to my first campsite of the trip. I laid out my groundsheet and gear, then hunkered down for what turned out to be a delightful evening. The second day dawned beautifully. The sun rose into a flawless blue sky as the breezes of the previous evening faded away. I took my time on that second morning, enjoying my rituals and thinking about the day just passed as well as the day that lay ahead. The chilly morning temperature rose steadily with the sunshine (from a low of 25 degrees) and by the time I got back on the road I was good to go. I arrived at the Delle exit on I-80 and was surprised to find a full-service convenience store there. I had a second cup of coffee and filled my water bottles for the day ahead. I hoped to be in and out of Wendover by the end of the day, but I wanted to be ready for another night's camp, just in case I came up short. Leaving Delle I rode northwest on yet another stretch of the old Lincoln Highway that parallels I-80 on the south side. I was aiming for the north end of the Cedar Mountains and wasn't at all certain what road options I might find. My excellent maps showed all kinds of dirt roads, but I knew from experience that maps can fail to tell the full story. I figured that I might have to sniff things out a bit as I rode along. The passage was pretty straightforward, as it turned out, and I found my way through the hills using a number of lightly used railroad service roads. Along a railroad service road, west of the Cedar Mountains. By late morning I had crossed the interstate once again (Exit 56) in order to access the graded frontage road that runs along the north edge of the interstate. I stopped to check out the water options at the highway rest stop there (I had to jump a fence to do so) then carried on west past the last set of low hills to the edge of the Great Salt Lake Desert. At the Knolls exit I crossed the interstate again (via Exit 41) and continued west along the remains of the old two-lane highway that once carried motorists straight across the desert to Wendover, Nevada. Though not maintained, old Highway 40 proved to be the perfect thing for a lone cyclist. It ran parallel to the freeway about a half-mile to the south, far enough away so that I didn't hear any of the sounds of moving traffic. The old asphalt was badly buckled in places, and would have been hazardous for motorists, but it was great for riding. 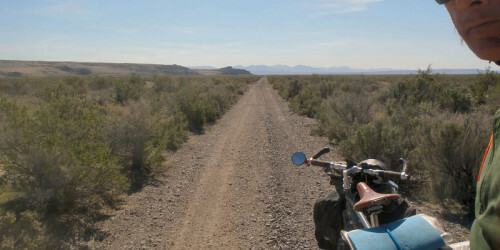 I spent the remainder of that second day leisurely and comfortably crossing the Great Salt Lake Desert, enjoying perfect riding conditions and the stark beauty of that very unusual landscape. And I didn't see a single soul during that 40-mile stretch. I had hoped to make Wendover with time enough to water-up, then carry on beyond before the end of the day, but that didn't work out. There were just too many interesting things to investigate along the way. All the dawdling I did left me just short of the town when the sun finally set for the day. I found a cozy zone in the foothills on the eastern outskirts of Wendover, away from the sights and sounds of that busy burg. I set out my camp far from any roads on a section of desert “pavement” and settled in for another very restful and relaxing night. I awoke at first light to a sky covered by a distinct layer of stratus clouds. But after a leisurely breakfast and load-up session, the eastern sun broke through, and I headed west on quiet roads into a sleepy Wendover just waking to a new day. It was a lovely way to begin my riding day. I made a quick stop at the Smith's at the top of the hill to fill bottles and have another small breakfast, but by the middle of the morning I had climbed the hill west of town, crossed the interstate once again, and was riding north along a little dirt road that skirted the western edge of the Leppy Hills. All traces of the town had disappeared behind me as the lofty peaks of the Pilot Range came into view up ahead. The highest peaks were snow-capped, but they were well below the base of the persistent cloud layer above. Beyond the Pilot Range I could see hills and flats and what must have been the western edges of the Great Salt Lake. To the far north were the distant peaks of the Raft River Mountains. As I cruised along through the early afternoon hours I got some great views of the country to the north where I'd hoped to be in a day or so. A quiet road, east of the Pilot Range, heading north. I eventually hooked onto the graded dirt road that would take me north along the east side of the Pilot Range. It was a road I had ridden once before, coming from the north, and I remembered a pretty easy cruise on decently graded surface. This time around, though, the road surfaces weren't so hot, and the stretches of road with washboard were especially bone-shaking and hard to dodge. And by this time of the day a rather stiff north breeze had built up, too, so my progress through the late afternoon really slowed. Headwinds are never much fun, but they are part of nearly every bicycle tour and have to be dealt with one way or another. I wasn't in any hurry, so I dropped into the lower gears, continued to enjoy the views, and took it easy throughout that afternoon. By the time the sun was ready to set I had had enough of the wind. I left the road near the north end of the Pilot Range and pushed my bike along the edges of an isolated grove of pinion and juniper trees, hoping to find shelter. I found an especially fat juniper and set up my camp in its wind-shadow. It was as if a weight had been lifted. I enjoyed my supper as I took in the great views of the salt flats and minor ranges of hills to the east, as well as the end-of-day antics of a couple of rabbits in the nearby brush and trees. I could still hear the steady wind in the trees around me, but my camp was calm and soothing. I slept very well. On this fourth morning I watched the sun rise into a cloudless sky. The wind and clouds had disappeared during the night, and the morning temperature was climbing through the 30s as I finished breakfast and loaded up for the day. I hit the road feeling very relaxed and rested. The riding was easier that morning, and with the wind gone, the washboard didn't seem so bad. The time flew by, and by mid-morning I had come upon the former railroad community of Lucin, Utah. I thought I would take a closer look at the traces of the town before continuing on. I checked out the small, pipe-fed pond that can be found there, where the railroad passes through. It's surrounded by large trees and can be a very welcome place, especially on a hot summer day. It can also be a source of water for a thirsty bicyclist. My own supply of water was still fine, and would easily last another day or so under the cool, early springtime conditions I was experiencing. I left my filter packed away and for a while enjoyed the scene. The normally subtle sounds of desert birdsongs seemed especially rich and melodious there around the pond. It was a real treat. Riding north of Wendover, with snow-capped Pilot Peak in the distance. At Lucin accepted the invitation of an informational sign that encouraged me to ride northeast along what was once the historic Transcontinental Railroad. The tracks are long gone, but the railroad grades remain and are generally passable as very pleasant dirt roads. The section of grade I first encountered ran straight as an arrow for twenty miles, slightly elevated above the surrounding flats and stands of brush. The views were great. I heard an occasional vehicle on Route 30, passing nearby, a mile or so away to the north. Otherwise, all I heard were the sounds of springtime: birds and bugs and the whisp of a breeze. I pedaled steadily through the middle of the day, stopping frequently to enjoy the expansive views and imagine a time when the railroads were active and the surrounding lands were populated by people connected to the rails. It's a very quiet place now. I spent the rest of my day riding along the northern edges of the Great Salt Lake Desert. With the straight sections of rail grade behind me, I began to follow a more curving line through low hills and around wide flats. As I passed along the northern end of the Hogup Mountains, I found myself in a maze of roads mixed in with the original railroad grade. After a bit of backtracking and head-scratching I got back on route and heading north. However, by this time the afternoon had made the turn into evening and the sun was getting ready to set. It was time to camp again. As luck would have it, I was in wonderfully open country with unobstructed views in every direction. I had an unlimited selection of super campsites to choose from. I left the road and walked a slight rise for a hundred yards or so, found a cozy perch, and settled in for another very restful and comfortable night. Searching for a way through. Day Five dawned as beautifully as the day before. The early morning air was calm and still quite cool, but everything warmed nicely as the sun rose to the east. Larks flitted and insects hovered here and there, around my camp, as I went through my morning routine. I considered my day. That morning I would continue along the railroad grade to the east, but I was also faced with the certainty of getting back into populated regions before the day was finished. I wondered a bit about that. I hadn't seen a soul since leaving Wendover, and I'd become accustomed to the peace and quiet of these west desert regions. A few days of solitude had been a wonderful thing, but it had to end at some point. So, after loading up, I headed down the road. The rail grade held up well as I carried on to the east that morning. It skirted the northern edge of the lake and Locomotive Springs Wildlife Management area, then passed south of the Hansel Mountains. The Promontory Mountains came into view to the east as I crossed Hansel Valley using graded roads that bypassed the old railroad grade. 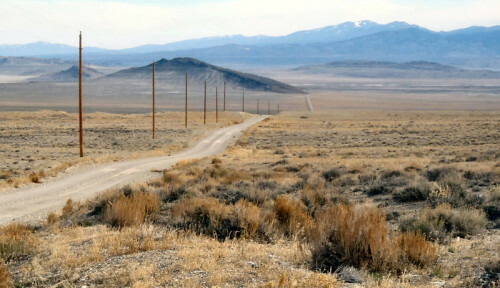 I began to encounter some traffic, and by mid-afternoon I had given up the dirt roads for the paved roads surrounding Golden Spike National Historic Site. I thought about a short detour to the visitor center to fill water bottles, but I still had plenty, and so decided to carry on to the town of Tremonton instead. The day was winding down, and it was a 15 mile ride to Tremonton, but I had the ease of paved roads again. I was pretty sure I'd have enough time to make the run before I ran out of daylight and had to camp. So off I went. 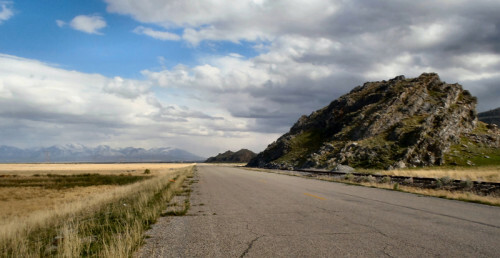 I rode the main road that connects Thiokol with Brigham City (highway 83) for a few miles, then left that road to ride northeast through the tiny farming communities of Penrose and Thatcher. It was a lovely evening for a ride. The roadways were smooth, the weather was perfect, and the colors seemed especially rich and vibrant. As I zigzagged through the countryside, the low-lying sun stretched out my shadows and reminded me of the coming sunset and of the need for me to hustle along. I made Tremonton in time for a quick water stop then turned south, out of town and into the countryside, searching for a cozy spot for my last night on the road. A few miles south of town, as lights were beginning to come on in the few houses I passed, I left the paved road I'd been on for a marginal, grass-covered service path that ran parallel to a water canal. A few hundred yards down the road I found a nice little spot away from both the main road and the crop fields that bordered the canal, and settled in for the night. The sunset colors were magnificent as I set about fixing up a last evening meal. I had cut it pretty close at the end (hunting around in the dark for a campsite is never much fun), but everything worked out pretty well. I enjoyed my last supper on the road, then fell asleep to the soft gurgle of water falling somewhere nearby. I was awakened at first light by a raindrop or two falling on my face. I looked around but didn't see anything to worry too much about. The stratus clouds were back again, but they didn't seem to pose much of a threat. There was no wind, and the temps were downright balmy in the low 40s. I was pretty sure I wouldn't be getting wet any time soon, so I started up one last version of my morning routine. I drank my coffee, made entries in my journal, ate breakfast, cleaned up, checked the maps, then loaded up. I started out a bit early that morning, on a series of very quiet roads. I wandered south and east, then south and east again, through the countryside and in the general direction of Brigham City. I'd toured through this part of the world before and knew I'd be funneled south into Brigham City regardless of which side road or detour I chose to take. And that's the way it worked out this time around. I made Brigham City by mid-morning and rode quietly south through the neighborhoods west of the main drag. I dawdled awhile. I had a second breakfast, made some notes, and checked in at home. After all of that I hopped onto Route 89 for the mad run down through Perry and Willard and on to Ogden. Despite having ridden the route many times, that stretch of 89 between Brigham City and Pleasant View has never been much fun for me. And there aren't any decent alternate routes. The shoulders are really great in some places, but then don't exist at all in other places. The road surfaces vary, and the traffic can be just awful at times. But on this particular morning the traffic was light and considerate, and I had a nice little tailwind to help me along. I was pleased. It was a much nicer ride than I'd expected. Once past Pleasant View, the ride south to Ogden was a breeze. The tailwind stayed with me, and the consistent shoulders along the roadways allowed me to easily accommodate the inevitable increase in traffic. I had a second flat a few miles north of town, but found a nice spot nearby to make my repairs. I was homeward bound now, and as I swapped out tubes in the shade, I had a chance to consider the events of the past few days. It had been a lovely trip. I experienced the beauty of Utah's west deserts at an especially wonderful time of the year. I slept peacefully and restfully under the open sky, and I used my own steam to comfortably move through remote regions of our state; all things I dearly love to do. I had all that I needed to be comfortable. I stayed warm and dry, and my equipment worked like a charm. I saw new sights, heard new sounds, and had a brand new set of stories to take back to the kids at school. I was truly re-energized and ready to go. An hour later I was lounging on a southbound Frontrunner, enjoying the ride and thinking about where and when I might get away again. I covered about 300 miles over the course of six days. I rode a steel-framed bike with 26 inch wheels made by the Rivendell Bicycle Works. I used front and rear panniers, and I carried nearly seven liters of water capacity as well as a filtration device, which I didn't have to use. 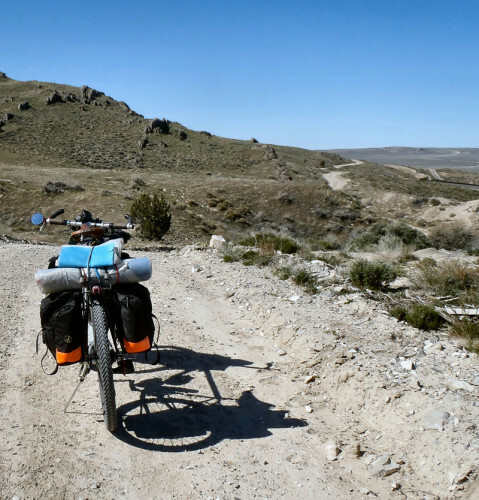 My bike and baggage weighed about eighty-five pounds, fully-loaded, on the very first day, and about sixty-five pounds when I rolled back up my driveway. Temperatures ranged from the mid 20s at night to the upper 60s during the day. I never needed to pitch my tarp tent. My gear worked beautifully, but one of two fuel canisters I brought with me failed to do its job. The second unit worked perfectly. My maps consisted of pages taken from the Utah and Nevada Road and Recreation Atlases. As usual, they proved to be wonderfully reliable resources.